This is possibly more appropriate that "What did you achieve this week?". One foot backward glide - free foot against the knee of the skating leg. 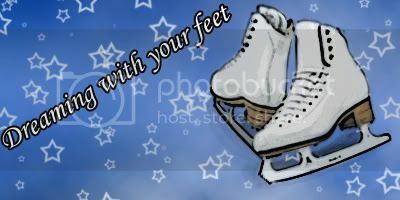 I can exceed the Skate UK required distance of my height easily but need to concentrate on keeping things in a straight line. He seemed to think I'd made progress, which was nice to hear as I'd had much less practice time than usual and was expecting a much worse lesson. He's also suggested I join a small mixed ability group he takes once a week for a lesson and I think I'll do that as it will get me learning other things too. So, what grade am I working on? Answers on a post card as he hasn't talked about grades or testing at all I can do all of the things listed above, it's just a question of tidying them up. Please feel free to post your lesson's contents as well. Re: What did you do in today's lesson? you get a double lesson yeah? I wish i could get that, my coach only does that for girls that are competing seriously and testing. He does lessons up to an hour but at the moment thirty minutes is right for me. So I think that it is about the same amount of things that Sarah did in a half hour lesson. You can learn a lot if your coach really concentrates on you only. Went through level 1 stuff (with appalling spirals & 'spins' I was a very boy) as listed above ^^^ BUT when doing a (fortunately small) Salchow I NARROWLY avoided crushing a national ice skating treasure - landed cms apart from her - she let out a small scream. Felt like such a pariah even though I'd adjusted & missed her...could have been pitchfork time in Streatham otherwise! [email protected]! Yes, I was there at 7.30 and had to leave to go for a gym session so was gone by 9.15. No afternoon patch session or even the empty public session for me. I do know what you mean about feeling as though you have leaden feet when on patch. I feel that way too and worry that I'm nowhere near good enough for patch! Luckily, when I had my lesson, the ice had few skating on it apart from a top dance pair - with whom I nearly collided as they rehearsed one of their dances. You are doing double jumps and still have only 15 mins lessons? I wouldn't like to have my lessons so short. That wouldn't be enough for me. But you must be a very quick learner then! I am quite opposite, a very slow learner. You are competing. Would your coach be willing to give you longer lesson if you started testing? Seriously, 15 mins is never enough for a private lesson. It usually lasts 30 mins, for private lessons, in the rink in Hong Kong and Singapore. However, the coach does give me private lessons twice a week, meaning that I have an hour lesson still in a week. My coach did give me about 7 minutes extra lesson on Thursday. 1) Forwards crossovers in both directions - this was the warmup and the only time I felt I wasn't obviously the worst in the group. 2) 3-turns while doing fancy things with the free leg - incredibly frustrating. 3) Backwards crossovers - at which point I had a huge panic. Everybody else started skating round in a circle backwards with their legs crossed with practiced ease. I'd never done a backwards crossover in my life. I have a 30 min lesson which is just right - I need the time to talk through the things I am attempting and to get loads of encouragement from my coach (not possible in 15 mins or group lessons really). So, once I finished my step sequence I could get on with Bronze properly. Am starting with Dance - so had a go at all 4 elements of bronze. Found the progressive runs OK because my coach pushed me so much to get good elementary cross overs right from the start; consecutive 3 turns are OK but ragged at the moment; my barrel rolls are embryonic . My favourite is the crossed chasses as I fully expected to fall over backwards lol but managing fine! I am really motivated now which is great. I haven't done bronze singles moves in my lessons although have done at Camp. We have two sets of 30min+ lessons with different coaches on different days. One set can be variable depending on other people's lessons. Can be 45-mins. Starlight Waltz - work on lady's inside open mohawks and the following change hold 3-turn - dancing it together. 10-Fox - edges - especially into man's 3-turn. Phew! Got an early morning session this week to practice all that. Starlight Waltz needs lots more work on timing and pattern as well as the steps. As you can see from the variety of levels, still lots of work to do on basics.